The showcar, known as the Audi AI:ME, offers compact dimensions, a spacious, futuristic interior, and the ability to drive autonomously at Level 4. This allows the occupants to do what they like with their time on board. The Audi AI:ME offers a broad range of high-tech features for communication, entertainment, or simply relaxation. The car is increasingly becoming a 'third living space' alongside our homes and workplaces The body line of the Audi AI:ME demonstrates how emotion and spatial economy can form a perfect synthesis in an electrically driven compact car. There is a reason that the name AI:ME emphasises the relation to the Audi AIcon, the study of automated long-distance operation introduced in 2017. The affinity of the body line and the concept of these two cars will become evident in Shanghai, as the AIcon will flank the world premiere on the stage of the Audi booth at Auto Shanghai 2019. With an exterior length of 4.3m and a width of 1.9m, the Audi AI:ME takes up as much traffic space as a present-day compact car. However, the wheelbase of 2.77m and the height of 1.52m indicate interior dimensions that are more likely to be found in the next higher class at least. This is made possible by the architecture of the electric drive. It allows for short overhangs and a large-volume interior without a propeller shaft tunnel. The drive unit is positioned on the rear axle and mobilises 125kW. For the occupants, the compact drive package offers a maximum amount of objectively available space, spatial comfort, and a great deal of variability. The Audi AI:ME is designed as a two-plus-x-seater. Its layout relies on a variety of configurations for seat positions and stowage space. 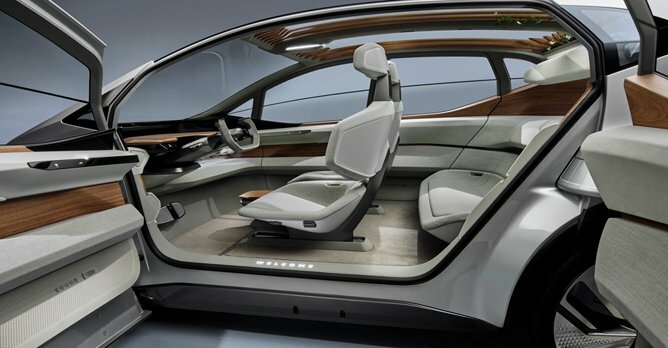 While only the individual seats at the front will be used during most journeys, the car offers space for up to four people in the front and on the rear bench if necessary.